The Texas Cavalry Service Medal is a service medal of the Texas National Guard which was created by the Texas Legislature under Senate Bill 955 and signed into law by Governor Rick Perry June 17, 2005. Senate Bill 955, an amendment to Texas Government Code § 431.134, became effective on September 1, 2005. The Texas Cavalry Medal is awarded to personnel who served on or after September 11, 2001, in the 124th Cavalry, Texas Army National Guard and who served in a hostile fire zone as designated by the United States Secretary of Defense. This medal is a one time award and there is no provision for subsequent awards. The first 182 cavalry troopers eligible for the award completed their tour of duty in Iraq on February 11, 2005. Carrying the same unit heraldry as the 1st Squadron, 124th Cavalry Regiment, members of the Texas National Guard's Brigade Reconnaissance Troops mobilized for Operation Iraqi Freedom III were also eligible for this award. The final awarding of the medal went to members of 1st Squadron, 124th Cavalry for their service during Operation Iraqi Freedom 09-11 in 2008-2009. The order of precedence for this new award has it falling between the Texas Combat Service Ribbon and the Texas Faithful Service Medal. The Texas Cavalry Service Medal is no longer awarded. The pendant of the medal is in the style of a Texas Ranger badge. The star is enameled in antique ivory with a gold outer ring. Between the arms of the star is cutout. In the gold outer ring are the words TEXAS CAVALRY. Superimposed over the center of the star are a set of crossed cavalry sabers. The medal hangs on a silk moiré ribbon suspended by a ring. The ribbon is yellow, 1 3/8 inches (35 mm) wide. In the center is a white stripe 7/16 inch (11 mm) wide, bordered by green stripes 3/16 inch (4.8 mm) wide. When the medal's service ribbon is worn, an enameled cross sabers device 3⁄8 inch (9.5 mm) wide is centered on the ribbon. 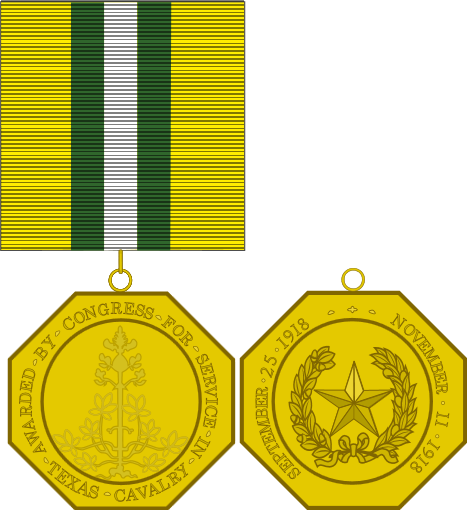 The Texas Cavalry Medal was a federal service medal, approved by the United States Congress and awarded to the members of the cavalry brigades raised by the State of Texas who were not called into federal for service in 1917 and 1918, rendering the men of those two units ineligible for the World War I Victory Medal. Qualifying dates of the Texas Cavalry Service Medal were from December 8, 1917 to November 11, 1918. Only 840 medals were awarded for this time period. The Texas Cavalry Medal was created by Congress to commemorate federal service, and is the only medal specifically for state troops awarded by the federal government. For this reason, the legislation authorizing the Texas Cavalry Medal specifically authorizes its wear on active duty United States military uniforms. The medal was designed by Anthony de Francisci based on design and imagery criteria specified by The Equipment Branch, Quartermaster General Department of the Army. The approved design is a bronze hexagonal medal 1 1/8 inches (29 mm) in diameter. The obverse of the medal depicts the bluebonnet, the state flower of Texas. Inscribed around the edge are the words AWARDED • BY • CONGRESS • FOR • SERVICE; at the top of the medal and TEXAS • CAVALRY; at the bottom of the medal. The reverse of the medal bears the Coat of Arms of Texas, a Lone Star encircled by a wreath, surrounded by the dates of service in 1918 when the cavalry became eligible for federal activation and the signing of the armistice to end World War I.